Shandong BeBright among companies to benefit from government policies, Yuan Shenggao reports. In recent years, the company reported rapid growth because of its strong research and development capacity and quality control. However, the company still faces major pressure because the market has become more competitive. "We only have testing and design departments. Packaging was outsourced, which caused many problems such as delayed feedback and longer production periods," said Zhang Chengqiang, a deputy department head from BeBright. To better adapt to changing market conditions, BeBright has invested 30 million yuan ($4.38 million) to launch a packaging project. It built the top workshops and purchased the advanced production equipment to build a complete industrial chain, according to the company. During the upgrading process, the zone government provided BeBright with strong support. "The approval process was completed in a week with support from the zone government," Zhang said. Before that, it was usual to take 10 to 15 days to finish the process. There are numerous companies in the zone facing similar situations. Shandong NovoShine Optoelectronics recently upgraded its production technology for pattern substrate to enhance the luminous efficiency of its LEDs. In the first half of 2018, NovoShine saw a 68 percent year-on-year increase in sales revenue, even though the market situation was not as good as previous years. "We plan to be the top business in the industry in the next three years," said Wang Jinxiu, deputy general manager of NovoShine. But that will require help from the zone government - which has taken a series of measures in recent years to provide tailor-made support in such cases. 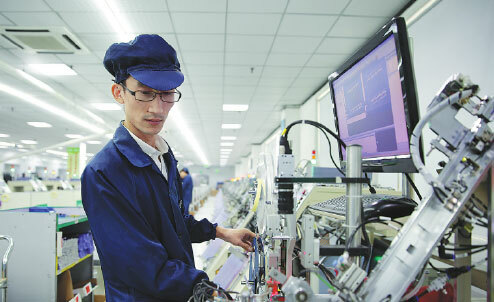 "An enterprise's development process is similar to helping plant to grow, which needs support from the starting point," said Zhang Zhenshu, director of the Development and Planning Office at the zone's technology bureau. By optimizing the allocation of technological resources, the zone has established platforms that assist with technology research, innovation support, technological education demonstration and traditional technology innovation. The zone has also paid close attention in recent years to key sectors such as new energy, automotive manufacturing and advanced chemical products manufacturing. It is strongly supporting 47 technological upgrade projects in the zone, which will involve a total investment of 15.8 billion yuan. It also lending a hand to 25 projects, which each have more than 100 million yuan total investment, according to the local authority. By the end of August, some technological upgrade projects had been finished, increasing the pace at which the zone can replace old economic development drivers with new ones. Shandong Ipre Inspection Technology, a quality management equipment developer in the zone, has joined forces with four leading Chinese universities including Zhejiang University and Beijing University of Technology to develop testing equipment, aiming to better serve businesses keen to achieve good results in the Industry 4.0 era. Ipre's management believes that quality control equipment in China will become more intelligent and advanced in industrial upgrade process. Fu Dongyi, general manager of Ipre, said connecting traditional quality control equipment to the internet allows the company to promote its business model, called Software as a Service, or SaaS. Under this model, businesses will be able to use the quality control equipment for free but will pay for the software. Fu said the project reduces work pressure on quality controllers and increases their efficiency and accuracy. The model will also push the company out from homogenization and reduce companies' reliance on some imported testing equipment. In the first half of 2018, companies in the zone reported an overall value of industrial throughput of 47.7 billion yuan, an increase of 12.7 percent year-on-year. Of that total, high-tech companies contributed 35.3 billion yuan, an increase of 10.6 percent year-on-year. Cui Chengwang contributed to this story. Shandong BeBright Semicon-Tech is a high-tech company specializing in the production of LEDs at the zone.